The National Chairman of the All Progressives Congress, Adams Oshiomhole, on Friday made a veiled reference to former President Olusegun Obasanjo, who he said had suddenly become an “organising secretary” busy hiring “tired players” to continue with his third term agenda. He however said Nigerians had already rejected the former President because they were not ready to return to the era of the Peoples Democratic Party, during which government’s funds were shared to party faithful. This, he said, was the reason the coalition being formed by the PDP and other political parties ahead of the 2019 general elections would fail. Oshiomhole said this in an interview with State House correspondents shortly after a meeting he had with President Muhammadu Buhari at the Presidential Villa, Abuja. He said contrary to opinions, it was the PDP that was being affected daily by mass defection, and not the APC. He said if the ruling party could win the 2019 presidential election when the PDP was still united, it would not be difficult to win again as the opposition party had split, saying the party’s founding fathers like Prof. Jerry Gana had since left it to form another party. The former Edo State governor said it was funny that the same people who left the PDP to form other parties were coming together to form a coalition. Oshiomhole said, “Just few months back, you know that after their convention, a good number of people like Prof. Tunde Adeniran and Prof. Jerry Gana, who are said to be founding fathers of the party, left to form what is called the Social Democratic Party. “So, they broke out and when it dawned on them that even together we defeated them just four years ago. Now that they are further factionalised, what can they do? “They just want to capture power for the sake of power. And they said ‘Okay, even though we have already broken the house into pieces, for the purpose of capturing power, let us come together.’ Does it make sense? “There is no better proof than that old man who is going round as an organising secretary, recruiting people, looking for tired players to continue with his third term agenda which Nigerians have rejected. The APC chairman described the party’s victory in the Ekiti State governorship election as a good outing for him, having emerged as the party chairman just last month. He said the challenge now was for the governor-elect, Dr. Kayode Fayemi, to ensure that the people of the state recover from the lost ground arising from the alleged poor governance that was provided by the current PDP government. However, reacting to Oshiomhole’s veiled reference to Obasanjo, the Chairman of the ADC, Chief Okey Nwosu, said the APC chairman was a factional chairman of the party and therefore deserved no response. Nwosu alleged that it was laughable that the ruling party, which was pretending to fight corruption, could spend billions of naira buying votes in Ekiti State. He said the APC had failed to deliver on its promises and had therefore resorted to propaganda in a bid to distract Nigerians. 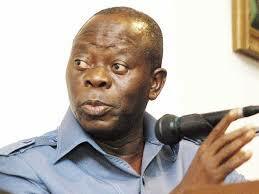 He said, “Oshiomhole is a factional chairman. We in the ADC are focused and organised and don’t have time to be debating with a factional chairman. The propaganda and lies are no longer working and we are on a mission to rescue Nigeria. “Nigerians are now aware of the propaganda and lies of the APC. Nigerians have seen how the election in Ekiti happened. The Ekiti election was not a victory but a mere exercise of sharing N15bn.